...a place to illuminate one's creative potential. This tag will be one of the projects at the Holiday Tag workshop hosted by Hive in Gastonia, NC. December 6th! This tag started with a 3X5 index card that I drew a black line drawing of a holly leaf and berries. I laid the drawing under the gelli plate so that I could see the design through it. I used a small paint brush to do a light colored leaf on the gelli plate, then printed. The next print was a swoosh of another green through the center of the leaf and the third layer was a dark green outline and vein. Two layers of reds for berries. Each tag was pulled six times. Black pen outlining. Holiday Tag Workshop at the Hive! I love wrapping presents and making my own holiday gift tags! This one was made using my 3 x 5 Gelli Plate! Its the perfect size Gelli plate for tags and cards. I will be making a lot more tags, using a mixed media style at my workshop at the Hive in Gastonia, NC on December 6th. Working on stuff for a new workshop! Using Gelli prints with Sizzix die cuts on wood blocks. I am getting ready to teach my first workshops! 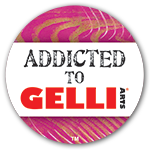 Workshop one will be a basic Gelli printing class. This little project will be the advertisement for my second workshop, how to use those wonderful Gelli prints. I will be teaching at Hive Supplies for Art and Living, a brand new shop and workshop space in Gastonia, NC. I am BUZZING with excitement to teach the things I love with new creative friends! I tried splatters...should have used a smaller brush! I am still playing with watercolors this summer. I came across a picture in Country Living magazine of some old rusty yard tools, ripped it out and stuck it in my "To Paint" folder way back when! Found the folder last night when I couldn't sleep (which is like every night lately... in the back of my mind, I know that my summer break is coming quickly to an end so I stay up to squeeze in more play time.) I pulled out the little picture and thought I would try to capture the rust in watercolor. It is done on a 4x6 hot press paper card. I then used my new photo corners to attach it onto a Gelli printed tip-in page of my art journal. I am really liking the photo corners..it allows me to take the little paintings out if I choose to. My trip to the farmer's market last Saturday was delightful. There was a man there selling his jars of cucumber pickles. I didn't get a good picture of his table but I found my source picture in a magazine. This was a project that taught us about color blocking: Painting color areas before drawing things. Different and I enjoyed the process! Creative Vintage Summer Market July 4th!